Welcome to RESIDE magazine, the luxury home & lifestyle magazine presented by the Sotheby’s International Realty brand. 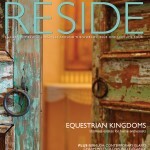 RESIDE is a celebration of the creative imagination between home, art and living. This issue welcomes readers with one of our most captivating covers yet. The cover home is a sprawling Colorado estate, built around 40 mesquite doors reclaimed from Mexico, South America and Morocco. The feature article takes readers through some of our network’s most spectacular equestrian estates, while providing insight on how to select the perfect property for horse enthusiasts. Also featured is Deepwater, a regal yet charming Mediterranean style home on the shores of Bermuda. With over 40 pages of International listings in the Property Gallery, this issue continues to demonstrate the power and global presence of the Sotheby’s International Realty® Network. RESIDE is distributed to a highly targeted circulation of readers, including the recipients of Sotheby’s at Auction and select subscribers of Architectural Digest, Wall Street Journal and The New York Times. We hope you enjoy the digital version. If you are interested in receiving a hard copy and to be included on our mailing list, please fill out the “Contact Us” page on our site or email us directly at toni.schemmel@sothebysrealty.com.